How you price your Ann Arbor home will have a direct impact on how many buyers, showings, and offers you attract — and ultimately how easily it sells. At the pyramid’s center is the fair market value at which a reasonable percentage of buyers would view and purchase your home. When you price your Ann Arbor home below the market you’ll attract a greater percentage of buyers, and when you overprice it you’ll attract a lesser percentage of buyers if you attract anyone at all. General definitions of market value usually say that it is the price a home should sell for when it has been on the market for anywhere from three weeks to two months. However, if you want top dollar for your home, experience shows that you should try to get and accept a solid offer sometime during the second to fourth week that it’s on the market. It is during this three-week “window” that your home will enjoy maximum market exposure and buyer interest. Beyond five weeks your home will increasingly be viewed as a “stale” or “time-worn” listing — i.e. as a commodity with a history of being rejected by other buyers. Consequently, there will be less interest, fewer showings, fewer offers, and less likelihood that you’ll get your asking price. This is why it is crucial that your home be priced correctly during the first few weeks it’s on the market. What’s Important When Pricing your Home? The most important decision you will make is where to price your Ann Arbor real estate. Pricing at fair market value will attract more buyers and will normally result in a higher purchase price. Overpricing results in a longer market time and possibly a lower price. Historically, your first offer is usually your best offer. The value of your property is determined by what a BUYER is willing to pay in today’s market. Buyers make their pricing decision based on comparing your property to other properties available in your market. Another important reality in today’s market is that properties must APPRAISE at the agreed-upon purchase price in order for a deal to be approved by the buyer’s lender. Appraisers determine value based on historical information—what has sold recently in your area that is similar to your property. You must use both past history and current competition to determine the best price for your home. Our job is to provide you with Ann Arbor market data and all the factors that affect the value of your home so that when we are done you will have all the information you need to make an intelligent business decision. 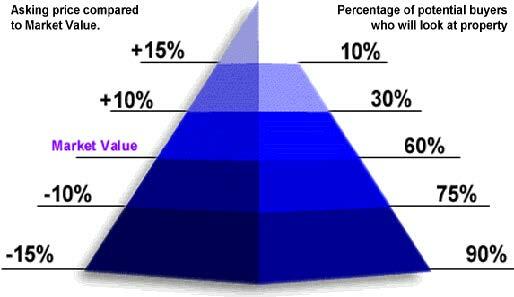 Our job is to help you understand the market, but you determine the price. 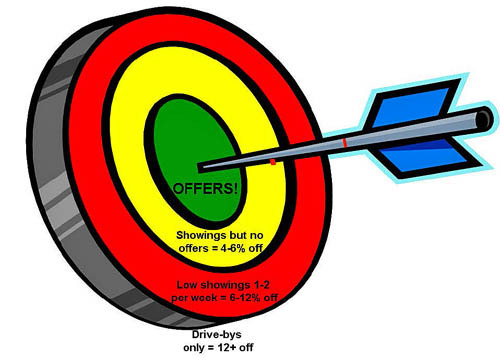 Is Your Price on Target? Our best marketing time is in the first 30 days! The strategy of overpricing your Ann Arbor real estate — knowing that you can reduce the price later — might make sense at first glance. However, it seldom works. In fact, sellers who overprice their properties — even just 10% above market value — often end up getting less than they would if they had priced it properly from the start. Fewer buyers will respond to ads, fewer agents will show your property to their buyer clients, and you’ll get fewer serious offers. Inflated prices often lead to mortgage rejections and critical lost time waiting for finance approvals that don’t go through. Reducing the price after buyers have begun to perceive your home as a “stale” listing will not generate nearly as much interest as if you’d priced it properly from the start. This is why pricing your Ann Arbor real estate correctly to coincide with its window of maximum market exposure and buyer interest is so important. And if we determine the price isn’t right, we need to make a price adjustment quickly and continue adjusting every two weeks until we get an offer.